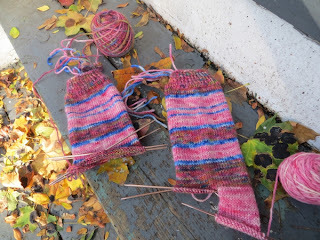 For some reason - possibly unrelated to all the other stuff I've been showing you lately, ahem - I am still working on these socks. 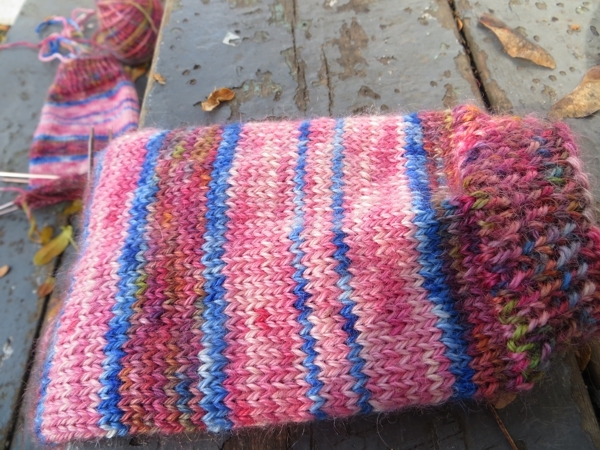 I love these socks very much, and I love knitting them, and it's quite surprising to me that they are still on my needles. Also a little frustrating, because I now want these needles for Christmas gift knitting. Why oh why I didn't buy eight dozen pairs of my favourite square needles before the company switched over to a different metal and unfriendlier tips, I do not know. False economy, my old nemesis. Seriously, these needles are practically the only thing that makes me wish time travel was actually possible. Them, and awesome 1950s kitchen accessories, because Priorities. especially if I sit down and knit them. Hope you get to sit down and knit today. See you tomorrow!